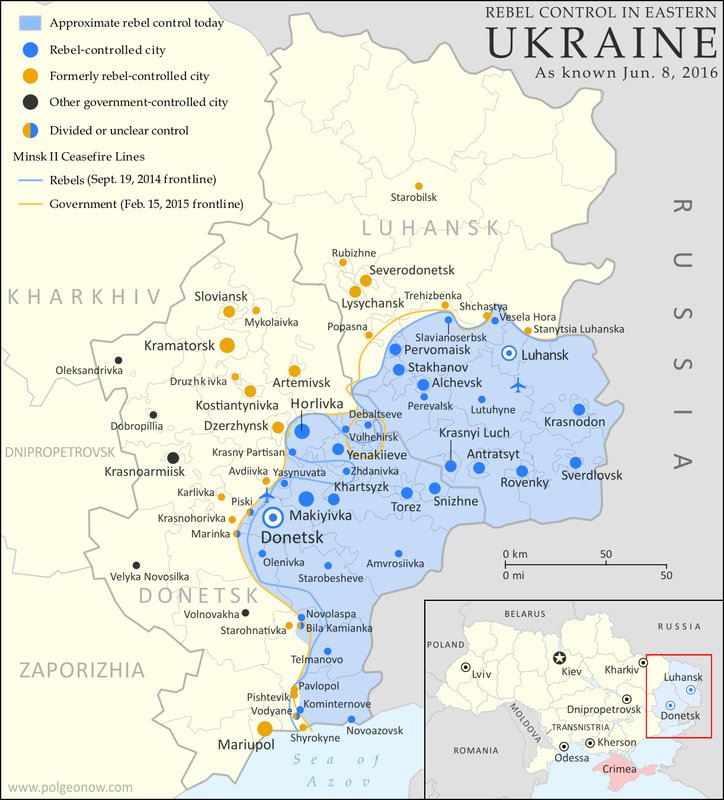 PolGeoNow's previous Ukraine control map report was published in March of last year, just a month after a ceasefire was implemented under the Minsk II agreement, a hard-won deal between the Kiev government and representatives of the self-proclaimed Donetsk and Lugansk People's Republics (established by rebels with extensive support from the other side of the Russian border). Since then, the ceasefire has broadly held, which explains why the war in eastern Ukraine has largely dropped out of world newspaper front pages. However, fighting has continued off and on at a reduced level, and the ceasefire agreement is still on shaky ground. This map and timeline report describe what has happened over the past year, including some small changes to territorial control. The following is a chronology of changes to territorial control and other major events since our previous update of March 2015. Reuters reported the accounts of four villagers from a rebel-held village that pointed to rebel involvement in the downing of Malaysia Airlines Flight 17. However, the report noted that the accounts do not conclusively prove the specific missile was the one that brought down the plane, because none of them saw it being launched. The Russian foreign minister, Sergey Lavrov, condemned the Reuters report on the downing of the Malaysia airliner, called it “stovepiping”, and pointed to contradictory statements being made by the witnesses. He additionally called for an “unbiased, professional” investigation. Kiev submitted a formal request to the United Nations for peacekeepers to be deployed to the conflict zone in east Ukraine. The rebels were reported to be in control of 30 percent of the village of Shyrokyne, near Mariupol. It was revealed that rebel forces had established two bridgeheads across the river Seversky Donets, near the government-held town of Stanytsia Luhanska north of Luhansk, after capturing two bridges between March 16 and March 20. The OSCE reported that 50-60 percent of the coastal village of Shyrokyne had been destroyed in the fighting, while a two-day ceasefire was still holding in the area. The United Nations OCHA organisation reported that the death toll from the conflict had reached at least 6,083 by March 27. A large number of casualties were still being accounted for, especially in the area of the Donetsk airport and Debaltseve. According to Ukrainian military officials, separatists tried to push the frontline closer to the Bakhmutka highway in the Luhansk region. It was confirmed that the village of Vodyane, seven kilometers east of Mariupol, was captured by the separatists after it was reportedly in the middle of a no man’s land for almost a month following a government retreat. Overnight fighting that started the previous day and continued into the early hours of the next led to the highest death toll since February. Six Ukrainian soldiers and four separatist fighters were killed, while 17 separatists and 12 soldiers were wounded. A Russian journalist was also injured. Separatist forces were reported to be in control of much of Shyrokyne, but fighting in the village continued. The United Nations OCHA organisation reported that the death toll from the conflict had reached 6,225. Separatist forces reportedly crossed the plain between Donetsk and Avdiivka and set up a bridgehead on its northern side along the railway tracks which was later reinforced with bunkers and trenches. The chairman of the Ukrainian parliament asserted that more than 100 Ukrainian soldiers had been killed and over 500 wounded since the ceasefire was declared on February 15. A resolution by the Cabinet of Ministers was published that updated the list of towns lost to separatist forces. According to the new report, since February 18, government forces had lost control of 15 towns in the Artemivsk district and three in the "Yasuvatsky" (Yasynovastky?) district. In addition, 10 towns were listed as being on the frontline and only partially controlled. A Ukrainian military analyst also reported that a force of 3,000 separatist fighters and several dozen armored vehicles was positioned near Mariupol and that rebel formations in the Artemivsk area were reinforced by infantry, 18 armored personnel carriers, seven tanks, and several trucks. Over the following day, five Ukrainian soldiers were killed in clashes on the frontlines. According to a Russian opposition report, at least 220 Russian soldiers had been killed in the conflict in eastern Ukraine (150 during the battle for Ilovaisk, south of Khartsyzk, and 70 at Debaltseve). Two Russian soldiers were wounded and captured by Ukrainian forces near Luhansk, according to military officials. The separatists said the two were policemen from Luhansk, while Russia said they were no longer active-duty soldiers in the Russian Armed Forces. Amnesty International accused both Ukrainian and separatist forces of war crimes such as summary executions, before and after the February truce, and torture. The commander of a separatist police battalion from the self-proclaimed Lugansk People's Republic, Alexei Mozgovoi, was killed along with six of his men after the vehicle they were traveling in was ambushed near Alchevsk, 40 kilometers west of Luhansk city. According to the separatists, Ukrainian forces fired over 150 mortar shells at their positions in Shyrokyne since the previous day. Some government mortar fire also hit the Donetsk airport. Meanwhile, in its newest report, the UN stated that it had documented the deaths of 6,417 people since the war started, including 626 women and girls. One day later, 16 medics were confirmed to have been killed in the conflict, and another 60 wounded, since it started. The military said the separatists launched an offensive against the government-held town of Marinka, west of Donetsk, using tanks and 1,000 fighters. The fighting reportedly started at 3 a.m. and lasted almost 12 hours before ending, but restarted once again later and left parts of the town on fire. The attack began with artillery fire, followed by an infantry and tank assault. The separatists denied they had launched an attack, and said government artillery fire hit their positions around Donetsk, killing 15 people. As the fighting at Maryinka continued, the separatists reportedly also attacked the neighboring town of Krasnohorivka. Both towns were left in flames as the rebels made attempts to break through government lines and soldiers were involved in bloody and chaotic street fighting. By evening, it was unclear who controlled Marinka, with the separatists saying soldiers withdrew from the town on their own and a member of the Ukrainian parliament also writing on Facebook that the rebels were in control of 70 percent of Marinka. However, the military later said that a ceasefire had taken hold and restored their control of the town. The overall death toll from government artillery fire around Donetsk stood at 16 separatist fighters and 5 civilians, while 86 fighters and 38 civilians were wounded. In addition, five soldiers were killed and 39 wounded in the previous 24 hours, of which four died at Marinka. An AP reporter who briefly visited Marinka reported the town was under government control and the military was conducting mop-up operations. The Ukrainian president claimed government troops had recaptured Marinka after expelling the separatists and capturing 12 “saboteurs”, including one Russian. His claim was not independently confirmed. For their part, the separatists claimed they killed 400 Ukrainian soldiers and wounded 1,000 at Marinka, while confirming 20 of their own fighters died and 99 were wounded. The rebels stated they did not attack Marinka, but that the fighting that took place was them counter-attacking against the Ukrainian military, and that if they were really attacking the town they would have captured it. Meanwhile, a UN official confirmed nine civilians were killed in the fighting around Marinka. A Ukrainian Coast Guard cutter exploded off the coast of Mariupol after hitting a mine. Five crewmembers were injured, one was killed, and a search continued for the boat’s missing commander. A Ukrainian military truck hit a mine near Krasnohorivka, killing seven soldiers and endangering the cease-fire. The Ukrainian president visited government trench lines near Mariupol, as more fighting at Shyrokyne left one soldier dead and two wounded. Ukrainian nationalists pelted the Russian consulate in Kharkiv (a major eastern Ukrainian city outside the conflict zone) with blue paint and eggs as a celebratory reception was being held on the occasion of the Russia Day holiday. In retaliation, the Ukrainian consulate in the Russian city of Rostov-on-Don was pelted with green paint and tomatoes, and empty cartons of eggs were left. The Russian foreign ministry accused the Ukrainian police of taking no action, in violation of the 1963 Vienna Convention on Consular Relations, in the Kharkiv incident. At the same time, Ukraine denounced what it called “barbarians” for the attack on their own consulate. Ukrainian government prosecutors charged two soldiers with murder in a rare public case of the government prosecuting its own soldiers. The two soldiers were accused of killing a 77-year-old woman and her 45-year-old daughter two days earlier in a rebel-held village near Donetsk. The two women were killed when the soldiers broke into their home and killed them with machine gun fire after allegedly suspecting them of pro-Russian separatist sympathies. The soldiers were charged with premeditated murder, which carries a prison sentence of seven years to life, just under a month after both the government and the separatists were condemned by international rights groups for torture and intimidation tactics. US opposition senator John McCain visited Kiev for talks with the Ukrainian president, during which he called for arms to be supplied to Ukraine. The same day, it was reported, per various government officials, that the separatists were still holding prisoner 127-200 soldiers and 70 civilians, while 289 soldiers were missing in action. It was also confirmed that the separatists had released 2,735 soldiers from captivity since the war began. The Parliamentary Assembly of the Council of Europe issued a report stating that 1,300 people were missing in the conflict. Of these, 1,200 civilians and soldiers were missing on the Ukrainian side, while 100 people were missing from the separatist side. The separatists declared Shyrokyne to be a demilitarized zone and withdrew from the village two days later. Shyrokyne continued to be uncontrolled by either side as both Ukrainian and separatist forces held positions on two separate hills outside the village. Meanwhile, Kiev claimed that Russia cut power supplies to the rebel-held part of the Donbass (Donetsk-Luhanks region), which was according to them a sign that Moscow was losing interest in breaking up Ukraine. An entire Ukrainian military battalion reportedly deserted after releasing a video in which the unit’s soldiers said they would no longer take orders from Kiev nor surrender their weapons, citing alleged neglect from their command. The commanding officer reportedly left his post, saying he was “unwilling to perform his functions” as the battalion commander. The deadliest fighting in over a month was reported as both sides accused each other of intensified shelling along the frontline, with the heaviest attacks taking place in the area of Horlivka. The fighting left eight soldiers, two rebels, and one civilian dead. Another 16 soldiers were wounded. Ukraine’s Justice Minister, Pavlo Petrenko, announced all communist parties in Ukraine would be barred from the local elections set to take place in October. Meanwhile, Russia’s Prime Minister, Dmitry Medvedev, warned that Ukraine could face a break-up similar to that of Yugoslavia unless the Kiev government showed “some flexibility”. Ukraine’s supreme court ruled to allow a parliamentary vote on constitutional amendments giving rebel-held territories self-rule. Parliament had voted with an overwhelming majority on July 16 to ask the court whether such constitutional changes were legal. Four armored cars belonging to international observers from the OSCE were destroyed in an arson attack in eastern Ukraine. According to the Ukrainian government, 200 separatists, backed up by tanks, stormed the village of Novolaspa, between Donetsk and Mariupol. According to them, the attack was repelled, but was followed by a second attack with an unclear result. The separatists denied they attacked the village and instead said it was always under their control but had come under government artillery fire. Later, the government claimed 400 separatists, again supported by tanks, attacked the village of Starohnativka, north of Mariupol. They stated they had lost some ground, but had regained it with the help of artillery fire. The separatists also denied attacking Starohnativka. A third, and the most deadly, battle was reported near Bila Kamianka, leaving seven Ukrainian soldiers dead and 11 wounded. Again, both sides traded blame for initiating the fighting. Ukraine returned heavy artillery to its frontline with the separatists following heavy fighting the previous day. The artillery had been withdrawn to 50km behind the frontlines as part of the February ceasefire. Kiev confirmed that Novolaspa was rebel-held. Russian president Vladimir Putin visited Russian-controlled Crimea after a night-long artillery exchange along the frontline in eastern Ukraine left nine people dead. Ukrainian forces suffered their highest single-day loss of life since mid-July, after seven soldiers were killed and 13 wounded over the previous 24 hours of fighting. 265 out of 320 Ukrainian parliament members voted in favor of a bill granting larger autonomy to the rebel-held territories. Following the vote, street clashes erupted in Kiev between protesters opposing the bill and security forces, resulting in the death of a 24-year-old National Guard member. Two more National Guard members died of wounds they received from a grenade explosion during clashes with protesters in Kiev the previous day. The grenade was allegedly thrown by a protester, wounding dozens of law-enforcement members. Meanwhile, a renewed effort to implement the February ceasefire was implemented in eastern Ukraine, and appeared to be holding. The United Nations reported 7,962 people had been killed and 17,811 wounded since the start of the conflict. According to the report, more than 400 civilians had been killed or wounded in the period between May 15 and August 15, due to artillery exchanges. International observer body the OSCE declared that the September 1 renewed ceasefire was still holding after more than 10 days, creating the possibility of political talks moving forward to end the conflict. Hundreds of pro-Kiev Crimean Tatar protesters launched a blockade of all three roads from Ukraine to Crimea in an attempt to halt the delivery of goods to the peninsula. Donestsk and Luhansk separatists stated that local elections in their territories were still to be held in October or November, as per the February Minsk peace agreement, despite Kiev arguing that they needed to be delayed due to continued security problems. Separatist negotiators backed down on the issue of scheduling for local elections, announcing that they would be postponed until February 21. The head of the separatist Donetsk People's Republic (DPR), Alexander Zakharchenko, rescheduled local elections for April 20, 2016. A Dutch probe concluded that Malaysian Airlines Flight 17, which crashed in eastern Ukraine on July 17, 2014, was downed by a Soviet-made surface-to-air Buk missile coming from rebel-held territory. It also pointed out that the incident would not have happened if the airspace over eastern Ukraine had been closed for passenger planes due to regional fighting. The inicident killed 298 people. Ukraine reported the death of its first soldier in a month from direct separatist fire. The first prisoner exchange since September 8 took place when eight soldiers and one civilian were swapped for 11 separatist fighters. According to the Ukrainian government, 89 soldiers and 59 civilians were still being held by the separatists, while the militants claimed 2,400 of their fighters and civilian supporters were being detained by the government. The Ukrainian government threatened to stop its withdrawal of light weapons from the frontline due to the rebels allegedly continuing to violate the ceasefire. The separatists reportedly completed their withdrawal of smaller weapons from the frontline, while the Ukrainian Army completed its own first phase of withdrawing light artillery two days later. Five soldiers were killed in fighting over a period of 24 hours, which represented the highest death toll for the military in two months. Unknown attackers blew up power lines in the Kherson area, leaving Crimea starved of electrical power. Two days later, the four pylons had still not been fixed as pro-Ukrainian activists, including ethnic Tartars and Ukrainian nationalists, blocked engineers from repairing them. Meanwhile, the Ukrainian government announced a temporary halt of all goods deliveries to Crimea. Russia announced it would halt its gas supplies to Ukraine, due to Kiev not paying up front for the gas, and that it also might halt coal supplies over the power blackout affecting Crimea. Ukraine banned Russian planes from using its airspace. The Ukrainian military claimed to have taken control of the villages of Pishtevik and Pavlopol, which were previously inside a buffer zone near Mariupol and not controlled by ether side. According to the U.N., the deaths of 9,115 people had been documented since the start of the conflict in eastern Ukraine. Despite a growing split among EU member countries over how long to keep sanctions imposed on Russia over its annexation of Crimea and involvement in the Ukraine conflict, the punitive economic measures were extended. The previous week the vote on the extension was delayed by Italian Prime Minister Matteo Renzi, who wanted to confront German Chancellor Angela Merkel over a “double standard”. According to him, Merkel had been forcing EU countries to agree to the sanctions, while Germany itself was engaging in projects with Russia that were contrary to the measures. The same day the EU measures were extended, Russia hit Ukraine with its own trade sanctions in retaliation for Kiev’s sanctions and EU free trade deal. The US imposed tighter sanctions on Russia over the Ukraine conflict. It was confirmed that separatists had captured the village of Kominternove, which was previously in a buffer zone near Mariupol and not controlled by either side. The first combat deaths of 2016 were confirmed as two Ukrainian soldiers and two rebels were killed in action. The Ukrainian president stated that electrical power would not be restored to Crimea until "Ukrainian sovereignty over Crimea is restored". Russia’s finance minister announced that Russia was open to “talks in good faith” with Ukraine over the 3 billion dollar debt that Kiev had defaulted on in December. The next day, his Ukrainian counterpart said there was still a chance to avoid a court battle. A statue of Vladimir Lenin in Donetsk was largely unharmed after a bomb exploded at its foundation. The explosive device was planted by an unknown group with the intent of demolishing the statue. In an upsurge in fighting in the east, three soldiers were killed and seven wounded. This was the highest number of casualties suffered by the Ukrainian military since November 14, 2015, when five soldiers were killed. Ukrainian prime minister Arseniy Yatseniuk barely survived a no-confidence vote in parliament among allegations of corruption, as well as criticism directed against the government’s record on reform. The following day, the fate of the pro-Western government was in doubt as the party of former prime minister Yulia Tymoshenko withdrew from the governing coalition. Nationalist demonstrators demolished the offices of two Russian banks in Kiev, as well as that of a holding company belonging to Ukraine’s richest man, Rinat Akhmetov. Police did not intervene. Two days later, the offices of three Russian banks in the western Ukrainian city of Lviv were set on fire. Ukrainian forces reported an upsurge in separatist shelling of their positions. Separatist forces reportedly withdrew from the Shyrokyne area, with the military taking control of the town. According to the Ukrainian military, a patrolling Special Forces squad on the front near Mariupol detected a separatist special operations group, and the subsequent engagement left two soldiers dead and five wounded. The military also claimed 30 separatists were killed. According to a separatist spokesman, government shelling of a nearby village lead to several civilian casualties. Online Russian anti-Kremlin group “Cargo 200 from Ukraine to Russia” published a list of 2,081 Russians they said had been killed or gone missing in eastern Ukraine. The list included Russian servicemen, separatist DPR fighters, and several journalists. According to the newest report by the UN, since the start of the conflict in eastern Ukraine, 9,208 combatants and civilians had been killed and 21,138 had been injured. Nineteen Ukrainian soldiers were reported killed and 128 wounded in the month of March. One of these died in a traffic accident. The government, the separatists, and OSCE observers all reported a sharp increase in ceasefire violations, on a scale not seen since September 2015. According to the government, one civilian was killed in a rebel mortar attack, while according to the separatists, one of their fighters was killed in shelling by government forces. Ukraine’s prime minister, Arseniy Yatsenyuk, announced he would submit his resignation to a vote in parliament on April 12, clearing the way for the formation of a new government. Ukraine’s parliament ended its session without a vote on the resignation of its prime minister. Observers described this as an indication of the inability of Ukraine’s political parties to form a new government, raising the possibility of a prolonged period of political uncertainty in Ukraine. Meanwhile, the separatist DPR reported that 90 of their fighters had been killed and more than 200 wounded during the past month in fighting along the frontline. The skirmishes mostly focused on three areas: the edge of the government-held industrial town of Avdiivka, the DPR-held railway junction of Yasynuvata, and near the DPR-held town of Horlivka. Two captured Russian soldiers were convicted in a Ukrainian court to 14 years in prison, after being found guilty of waging an “aggressive war”. The Ukrainian president had earlier raised the possibility of a prisoner swap, with the two soldiers being exchanged for a Ukrainian military pilot, convicted in a Russian court the previous month under charges that she directed artillery fire that killed two Russian journalists. The DPR once again pushed back its planned elections to July 24, with neighboring Lugansk also still waiting. A separatist spokesman stated a Norwegian mercenary working for a private military company was killed in a clash with a pro-Kiev militia group. Norway said it had no information on the alleged death of its citizen. Seven Ukrainian soldiers were killed and nine wounded in fighting in eastern Ukraine. Ukraine claimed seven Russian soldiers also died and 16 were wounded. The two captured Russian soldiers, Yevgeny Yerofeyev and Alexander Alexandrov, were exchanged for the Ukrainian military pilot, Nadiya Savchenko. Separatists reported that government forces attacked the out-of-service Donetsk airport, with the entire airport terminal being hit by fire from air defense guns, which should have been withdrawn under the terms of the ceasefire agreement. The government blamed the separatists for the escalation. Thirty-seven government soldiers were reported to have died during the month of May, while a separatist volunteer fighter said eight separatists had been killed in a town 10 kilometers north of Donetsk between May 30 and June 1. A new UN report stated that 9,371 people had been killed and 21,532 wounded in eastern Ukraine between the start of the conflict and May 15, 2016. The report noted 14 civilian deaths in the period between mid-February and mid-May 2016. With the UN previously reporting 2,500 civilians being killed by the end of August 2015, and 68 between mid-August and mid-November 2015, the total documented number of civilian deaths could be estimated at around 2,580. In addition, at least 2,960 of those killed (up April 15) were confirmed to be pro-government soldiers and militiamen by the Ukrainian National Museum of Military History. Finally, taking into account several reports by an anti-Kremlin online group and the separatist DPR, around 2,180 pro-separatist fighters had also reportedly died. Graphic of the Ukrainian flag is in the public domain (source).